Courtesy Masai, Flickr (CC BY 2.0). As go the bees, so goes human society. Recognizing the integral link between bee and human health, the OpenBeeResarch project has turned Barcelona into a living lab. By bringing together honeybees, technology, and big data analysis, they hope to decode bees’ complex and often mysterious behavior and make healthier cities. 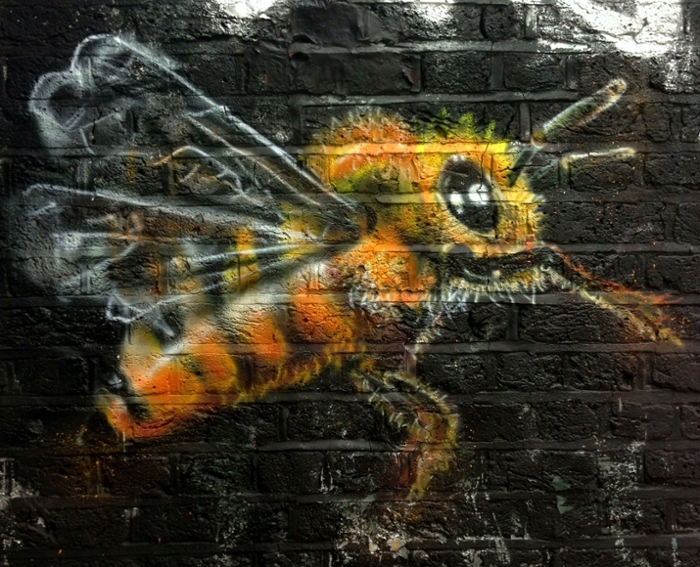 Bees can act as a biosensor for cities, and give a signal that could be easy to understand. OpenBeeResarch project is a new way to study bees, and turns a city into a living lab. Custom-made smart hives collect big bee data for one of Barcelona's 10 best big data projects. Once you start talking about bees, you open Pandora’s box … You’ll find small and very delicate stories behind them. Each one is interesting. If Josep Perelló is right, Barcelona’s citizen science urban bee project will have many interesting tales to tell. By applying big data analysis to honeybee activity, Perelló and his multi-disciplinary team hope to uncover bees’ complex and often mysterious behavior. Perelló, an associate professor in the Department of Fundamental Physics and project leader of OpenSystems UB at the Universitat de Barcelona, specializes in complex systems and data analysis (particularly for large amounts of data streaming from many sources). Honeybees arrange themselves in complex organizations, a fact that has long fascinated scientists – and increased awareness about their environmental importance has made them good candidates for an open lab experiment. Recent studies, for example, suggest that bees are sensitive to pollution, and small fluctuations in ozone levels can affect their behavior. Researchers behind the Barcelona project hope that insights generated from data on beehive temperature, humidity, and weight might provide clues to creating healthier and sustainable environments for bees and humans. To get data that tells a more complete story about Barcelona’s bees and their surroundings, Perelló began looking beyond traditional research methods. Traditionally, scientists have monitored bee behavior by sight, taking notes in a controlled lab setting. While that’s helpful in many respects, it doesn’t correspond with real-life situations. Barcelona’s OpenBeeResearch project, overseen by OpenSystems UB and spearheaded by Perelló, bucks that trend. It makes a city park a living lab, and a colony of honeybees at the Museu de Ciències Naturals (Museum of Natural Sciences) the buzzing heart of sensor-captured real-time big data. That data, in addition to helping scientists, can also be visualized in a way that helps people understand bees and their communities — and, more broadly, human society. To develop a conversation about the project, OpenBeeResearch held workshops to figure out which variables to track, how to design the prototype beehive, what types of sensors and communications equipment could be used without harming the bees, and whether lessons from other urban bee projects in Helsinki and Bordeaux could be applied to the Barcelona initiative. The high-tech beehive prototype born from those discussions — a wooden box hooked up with infrared motion detectors, temperature and humidity sensors, and pressure sensors for tracking weight — was installed in June 2014. The beehive runs on free GitHub software and Arduino components for sound, weight and temperature, and bee counting; Data Science software handles the data representation. Though it’s still a fledging project, OpenBeeResearch has already marked some early successes. It has received funding from Socientize, the Barcelona City Council, and the Fundación Española para la Ciencia y la Tecnología through the Citizen Science Office of the Barcelona Lab. Recently, the newly inaugurated Big Data Center of Excellence of Barcelona named the project one of 10 best case studies. Minding their bees-ness. A diverse group of bee lovers including biologists, data scientists, physicists, engineers, beekeepers, technology buffs, urban gardeners, cultural managers, and artists started a citizen-science project in Barcelona to spy on the secret lives of bees. What stories will the project discover? Courtesy OpenBeeResearch Project. By Jennifer Baljko. Reprinted by permission from The Nature of Cities.